The “KOMKON REVERSE-01” reversible movement control system is designed to control traffic on one reversible strip by switching signals of combined two-way reversible traffic lights by commands of the control panel. 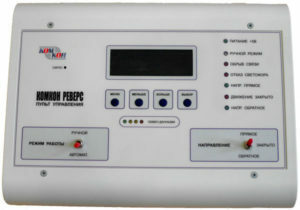 The product consists of a control panel of the complex, traffic lights SDR-T4 with control units and a switching cabinet. The panel contains a built-in power supply, a connector for the RS-485 interface cable, through which a cabinet with a media converter is connected to the control panel, converting the control panel signals into optical ones for transmission to the COMCON SDR-T4 traffic lights control devices. It is designed for automatic or manual switching of the modes of operation of reversible traffic lights according to specified programs. In manual mode, the reverse direction is reversed in the forward or reverse direction. There is also a mode for closing the band. In the automatic mode, the direction of travel is changed in accordance with the daily programs stored in the memory of the control panel. In this case, the closing of the direction of movement is made with a cascading off of traffic lights in the direction of travel. The main control parameters can be changed from the control panel. Reducing the impact of interference from power grids and lightning discharges is achieved by transmitting control signals over a fiber optic link or via twisted pair using the RS-485 interface.